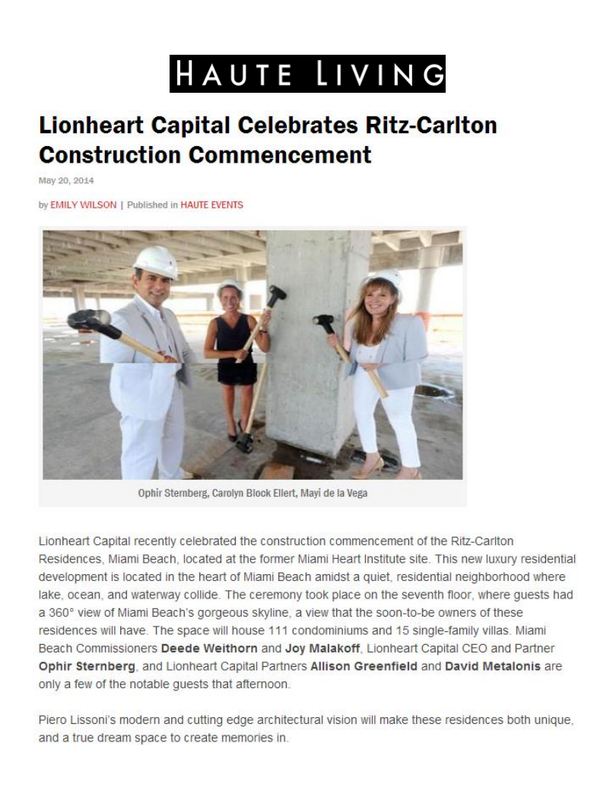 Lionheart Capital recently celebrated the construction commencement of The Ritz-Carlton Residences, Miami Beach, located at the former Miami Heart Institute site. This new luxury residential development is located in the heart of Miami Beach amidst a quiet, residential neighborhood where lake, ocean, and waterway collide. The ceremony took place on the seventh floor, where guests had a 360 degree view of Miami Beach’s gorgeous skyline, a view that the soon-to-be owner of these residences will have. The space will house 111 condominiums and 15 single-family villas. Miami Beach Commissioners Deede Weithorn and Joy Malakoff, Lionheart Capital CEO and Partner Ophir Sternberg, and Lionheart Capital Partner Allison Greenfield and David Metalonis are only a few of the notable guests that afternoon. Piero Lissoni’s modern and cutting edge architectural vision will make these residences both unique, and a true dream space to create memories in.